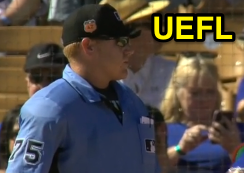 HP Umpire Tom Woodring ejected Dodgers RF Yasiel Puig for arguing strike two and three calls in the bottom of the 7th inning of the Cubs-Dodgers game. With one out and none on, Puig took a 3-2 pitch from Cubs pitcher Jim Henderson for a called third strike, having taken an earlier pitch for a called strike. Replays indicate the terminal pitch was located over the outer edge of home plate and near the height of Puig's hollow of the knee (pick f/x unavailable) while the previous pitch was located over the heart of home plate and around the hollow of the knee (no replay angle from the height of the playing field was produced), the call was irrecusable. At the time of the ejection, the Cubs were leading, 1-0. The Cubs ultimately won the contest, 4-0. This is Tom Woodring (75)'s first ejection of Spring Training, the 2017 MLB preseason. Tom Woodring now has 0 points in the UEFL Standings (0 Previous + 0 Spring Training = 0). Crew Chief Lance Barrett now has 0 points in Crew Division (0 Previous + 0 Spring Training = 0). This is the second ejection report of Spring Training 2017. This is the 2nd player ejection of 2017. Prior to ejection, Puig was 0-3 (2 SO) in the contest. This is LA-NL's 1st ejection of Spring Training, 1st in the Cactus League (LAD 1; Others 0). This is Yasiel Puig's first ejection since August 23, 2015 (James Hoye; QOC = Y [Balls/Strikes]). This is Tom Woodring's first ejection since July 29, 2015 (Terry Francona; QOC = U [Non-Ejection]). Wrap: Chicago Cubs vs. Los Angeles Dodgers (Cactus), 3/16/17 | Video via "Read More"